This recipe was presented at our Barrel Tasting in January of 2018 and is made with the La Vie Dansante Syrah Port and 2015 Syrah, neither of which were available at the time. You can buy the Syrah now, but you’ll have to wait awhile longer for the Port. You’re going to need an entire day for this one so pick a rainy weekend and have a bunch of movies ready. It’s actually not that much work, it’s just a long, slow roasting that brings together the flavors and makes the meat fall off the bone. Place a 5 quart casserole or Dutch oven over medium heat. Add the bacon and saute to release the fat. Season the Short Ribs generously on all sides with Salt and Pepper. Working in batches if necessary add the Short Ribs to the almost smoking-hot Bacon fat. Cook the ribs until browned on both sides. Remove the ribs from the pan, transfer to a large bowl and set aside. Meanwhile, prepare the bouquet garni by placing the Bay Leaf, Rosemary, Thyme, and Parsley in the center of a square of cheesecloth. Bring the edges together, tie with a piece of kitchen string, and set aside. Add the Carrots, Celery, Onion, and Shallots to the oil in the pan. Cook over medium heat until the vegetables are softened and golden, approximately 10 minutes. Add the Flour and Tomato Paste to the pan and stir to combine. You’ll be amazed at how quickly everything thickens. Add the LVD Syrah Port and stir until the brown bits have been scraped from the bottom of the pan. Add the LVD 2015 Syrah wine and simmer until the liquid has been reduced by half. Add the Garlic, Beef Stock, and the bouquet garni. Return the browned Short Ribs to the pan. Bring the liquid to a simmer over medium-high heat. Cover the pan and place it into the oven. Cook until the ribs are tender, approximately 3 hours. 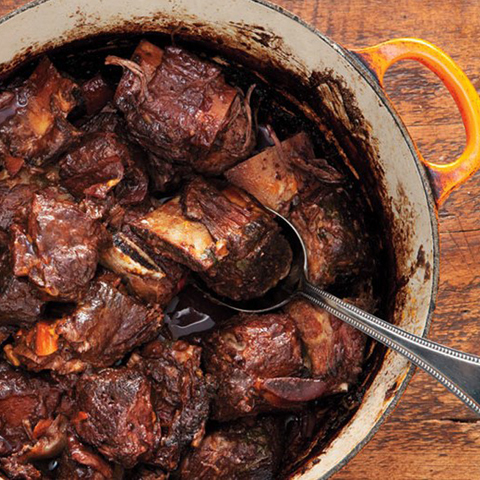 Remove the Short Ribs from the pan, place on a platter, put into the still warm (though off) oven. Strain the vegetable mixture over a bowl to capture all of the liquid. Using a gravy separator remove the fat that floats to the top of the liquid. Return the liquid to the pan and simmer over medium heat until the volume has been reduced by approximately 1/2 – the resulting demi-glace should thickly coat a spoon. Taste the demi-glace for seasoning and add Salt and Pepper as desired. Place 2 Short Ribs on each plate with a scoop of Mashed Potatoes, Rice, or even Pasta and drizzle both with the demi-glace. Sprinkle with Parsley. For an interesting kick try freshly grated Percorino Romano over the top. Sign-up to share our passion as we journey from daydream to reality.